Latin American Masters is saddened to report the death of Puerto Rican artist Arnaldo Roche-Rabell, who died Saturday at age 62. Roche-Rabell first gained international recognition in the 1980's for his sensual neo-expressionistic paintings. He was featured in the groundbreaking exhibition Latin American Artists of the Twentieth Century , Museum of Modern Art, New York (1992). Other exhibitions include Crisis Response, Rhode Island School of Design (2002); Portrait, National Portrait Gallery, Washington, D.C. (2006); Paint Made Flesh , Phillips Collection, Washington D.C. (2010); and Caribbean Crossroads, El Museo del Barrio, New York (2012). Roche-Rabell's paintings, characterized by the interplay of dense surfaces and their exposed underlayers, are felt as much as seen. The resulting works, self-portraits and still lifes, grapple with themes of personal and collective identity. "I could not tell you whether part of my conscious or unconscious comes to life in the process," he once said, "It is the physical act of painting that ratifies the urgency of my ideas." Roche-Rabell remains one of the most gifted artists of his generation. 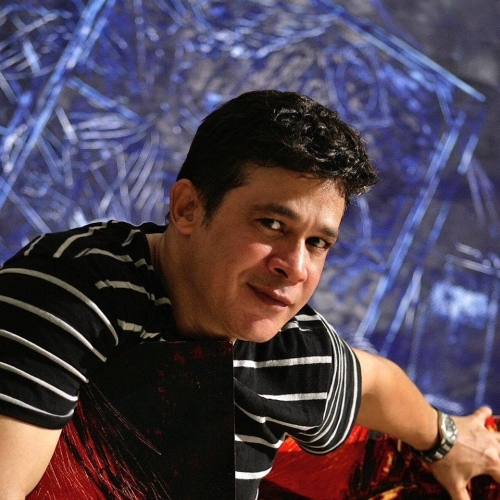 Latin American Masters is honored to have exhibited his paintings the past fourteen years. Arnaldo Roche-Rabell is represented in many important collections, among them: The Art Institute of Chicago, Chicago, Illinois; Museum of Fine Arts, Houston, Texas; Metropolitan Museum of Art, New York, New York; and Rhode Island School of Design, Providence, Rhode Island.